Click image to enlarge Cape Disappointment, Washington. As seen from the North Jetty, Cape Disappointment State Park, Washington. Image taken April 9, 2004. Cape Disappointment is the Washington point at the mouth of the Columbia River. The Pacific Ocean is on the west side of the cape and Baker Bay and Ilwaco, Washington are on the east. 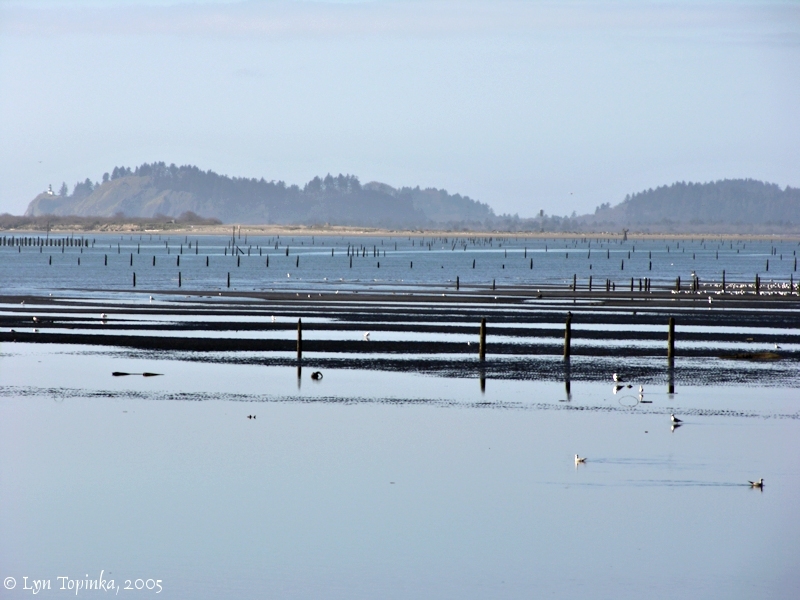 To the south across the Columbia on the Oregon side lies Clatsop Spit. The Cape Disappointment headland was first charted in August 1775 as "San Roque" (or "Cabo de San Rougue") by Spanish explorer Bruno Heceta, as he explored the Northwest Coast. Heceta recognized this location was probably the mouth of a large river but he was unable to explore since his crewmembers were weak and suffering scurvy. In July 1788, Lieutenant John Meares of the British Royal Navy used Heceta's navigational charts to explore the West Coast of North America while looking for the "River of the West" and located "San Roque". Meares decided that no river entrance or channel existed among the shoals at the base of "San Roque". He changed the name of "San Roque" to "Cape Disappointment". In 1792, American Captain Robert Gray named the headlands "Cape Hancock", while five months later British Lieutenant William Broughton used "Cape Disappointment". Lewis and Clark used the name "Cape Disappointment". The Indian name for the cape was "Kah-eese". 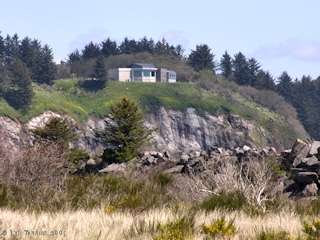 Cape Disappointment is the location chosen for Fort Canby, one of the three defensive forts at the mouth of the Columbia. On November 18, 1805, Captain Clark and a group of men reached the Pacific Ocean via Cape Disappointment. The "neck of Land low and 1/2 of a mile wide" is today's Waikiki Beach. The "high open hill projecting into the ocian, and about one mile in Sicumfrance" is McKenzie Head, where the men camped. Previously on November 14th, Captain Lewis and a group of men had reached the Pacific to the north of Cape Disappointment via Beards Hollow. 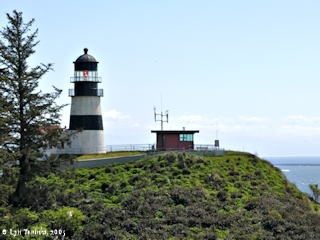 In 1975, Cape Disappointment was registered on the National Register of Historic Places as a National Historic District (District - #75001864) with such features as Cape Disappointment Lighthouse, North Head Lighthouse, Lighthouse Keeper’s facility, the North Jetty, and several gun emplacements from the old Fort Canby. "This cape is the only headland from Tillamook to latitude 47o 20' that breaks the low line of shore. It presents a geological formation not before met with on the seaboard, being composed of horizontal columnar basalt, rising to an elevation of 287 feet, disposed in a succession of huge round hills, broken on the sea front by short strips of sand beach, and covering an irregular area of about three miles by one. The sea-faces of all the hills and irregularly projecting knobs rise perpendicularly for many feet, then slope slightly inshore to narrow ridges; are destitute of trees, but covered with grass, fern, and bushes, and have an excellent though thin soil. Inland of their crests the trees commence, and their tops reaching above the summits of the hills increase their apparent height. The inshore slope of the hills is more gentle, so that paths can be easily carried to their tops. In 1851 we opened an ox-team road to the summit of the cape. When the evening fogs from the northern bays do not cover the cape, we have sometimes experienced a dense fog rolling down the river about sunrise, enveloping everything below the top of the cape upon which we have stood, when it looked like an island less than a hundred yards in extent, and surrounded by the river fog, that must be felt to be appreciated. We were 35 days on this cape before obtaining a single night's observtions. 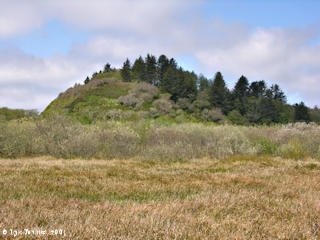 As seen from the southward, when off Tillamook Head, Cape Disappointment is made as two round-topped islands; approached from the northwest it rises in a similar manner, from the west and southwest it appears projected upon the mountains inland, but the slightest haziness in the atmosphere brings it out in sharp relief. This cape being basaltic, and showing an almost iron front to the river and sea, it is improbable that, "in the memory of many, Cape Disappointment has been worn away some hundred feet by the sea and strong currents that run by it." The primary astronomical station of the Coast Survey is on the highest part of the southern extremity of the cape. Its geographical position is: Latitude 46o 16' 35.2" north ... Longitude 124o 02' 01" west ... Or, in time ... 8h 16m 08.1s. From Cape Blanco to Cape Disappointment the extent of ocean shore line is not less than 285 miles. In August, 1775, this cape was place by Heceta in latitude 46o 17', and called Cape San Roque. In July, 1788, it was called Cape Disappointment by Meares, and placed in latutide 46o 10' "by an indifferent observation". It was called Cape Hancock by Gray, in 1792, and the entrance placed in latitude 46o 17', he, however, changed this name to Disappointment upon hearing that Meares had so named it. In 1792 it was placed in latitude 46o19' by Vancouver. On the Pacific coast it is and has been known by no other name than Cape Disappointment. The Indian name for the cape is Kah-eese." Click image to enlarge Cape Disappointment, as seen from Chinook Point, Washington. Cape Disappointment Lighthouse is visible. View from outside Fort Columbia State Park. Image taken February 19, 2005. Beards Hollow and Deadmans Hollow were named for the same circumstances - the sinking of the Vandalia in 1853. Beards Hollow lies on the north side of North Head and Deadmans Hollow lies on the south. Benson Beach extends from two miles from the North Jetty to the rocky base of the North Head Lighthouse. The 1/4-mile-long Benson Beach Trail goes from the end of the North Jetty Road and ends at a viewing platform overlooking the Columbia River and the Pacific Ocean. On February 20, 1920, the American steamer the Admiral Benson grounded on Peacock Spit in the fog and broke up after several days of wind. The wreck today still snags fishing lines off the coast of today's Benson Beach. Cape Disappointment Lighthouse is the oldest functioning lighthouse on the West Coast of the United States, and the Cape Disappointment Light marks the north side of the Columbia River Bar. Less than two miles to the northwest is the North Head lighthouse, which provides a beacon for the northern approaches to the Columbia River Bar. The Cape Disappointment Lighthouse was constructed in 1856 to warn seamen of the treacherous river bar known by then as "the graveyard of the Pacific." Click image to enlarge Cape Disappointment Lighthouse, Cape Disappointment, Washington. View from the Lewis and Clark Interpretive Center. Image taken April 19, 2005. Click image to enlarge Cape Disappointment State Park. Image taken April 9, 2004. In 1862, Cape Disappointment was armed with smoothbore cannons to protect the mouth of the Columbia River from enemies. Three years later in 1865 Fort Stevens, complete with a moat and drawbridge, was established across the Columbia on the Oregon side of the Columbia. In 1875 Fort Canby came into existence to improve the defense of the Columbia. In 1896 Fort Columbia was built and in 1897 Fort Stevens was improved. 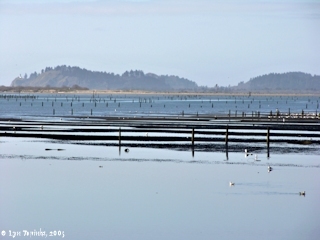 The mouth of the Columbia River was now protected with three forts. 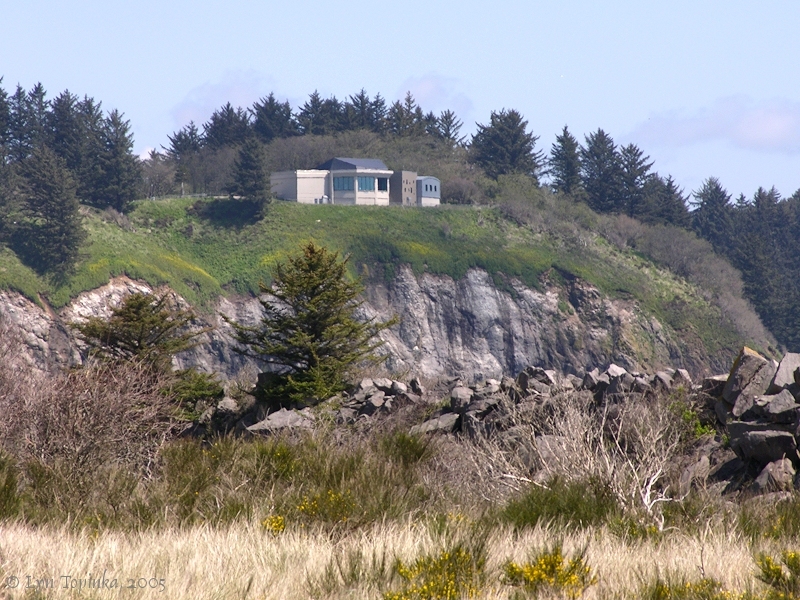 In 1973 the Lewis and Clark Interpretive Center was built at Washington State's Fort Canby State Park -- now Cape Disappointment State Park. Click image to enlarge Lewis and Clark Interpretive Center, Cape Disappointment, Washington. Image taken April 19, 2005. Click image to enlarge Lewis and Clark Interpretive Center. View from the North Jetty, visible in the foreground. Image taken April 19, 2005. 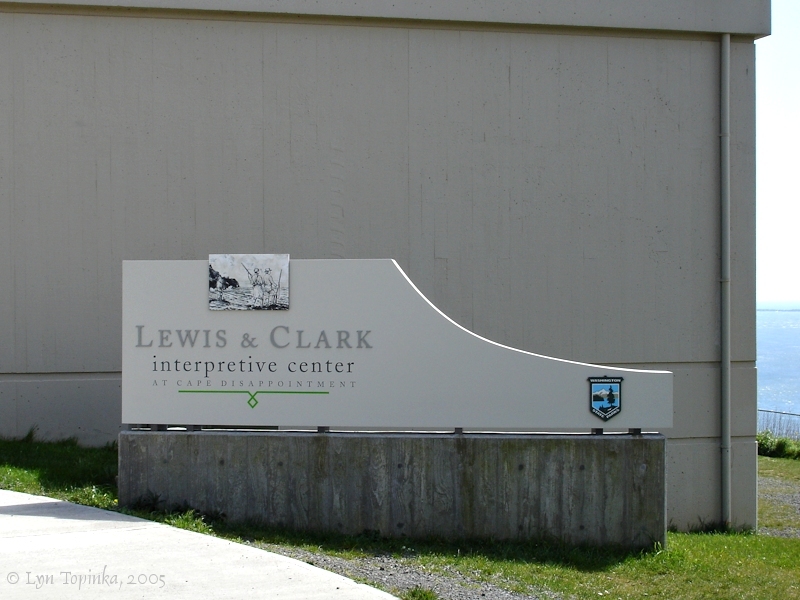 Click image to enlarge Lewis and Clark Interpretive Center. Image taken April 19, 2005. Lewis and Clark reached their destination - the Pacific Ocean on two different days. Captain Lewis and four men were the first to arrive on November 15, 1805, at a location near Beards Hollow. On November 18, 1806, Captain Clark and eleven men reach the Pacific at McKenzie Head, where they spent the night. Click image to enlarge McKenzie Head from North Jetty. Captain Clark and eleven of the men camped on McKenzie Head on November 18, 1805. Image taken April 19, 2005. 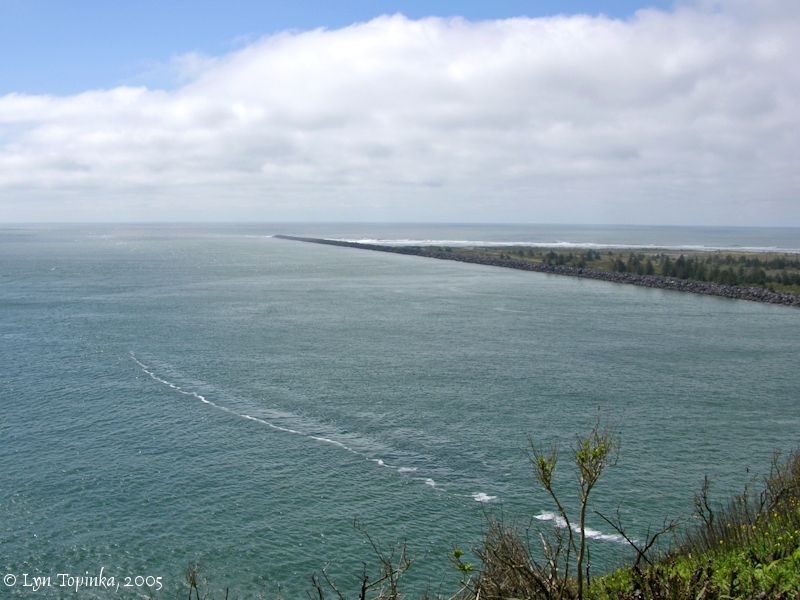 North Head is the extreme western point of Cape Disappointment. 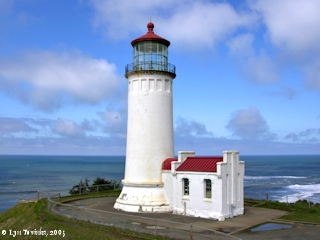 The North Head Lighthouse was built in the 1890s on a cape east of Cape Disappointment. Click image to enlarge North Head Lighthouse. Image taken April 19, 2005. In the early 1900s, jetties were built at the entrances to the Columbia River and Grays Harbor. Rock from these jetties came from the Fisher Quarry, upstream of Vancouver, Washington. These jetties were designed to scour out sandbars and keep navigation channels open. Construction of the North Jetty began in September 1913 and was completed in May 1917. 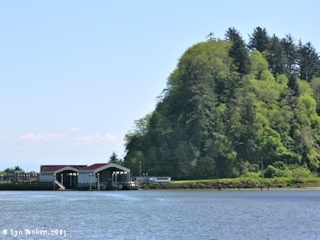 The jetty was built on Peacock Spit, a large shoal on the southwest side of Cape Disappointment. Following jetty construction, beaches north of the jetty grew seaward rapidly. 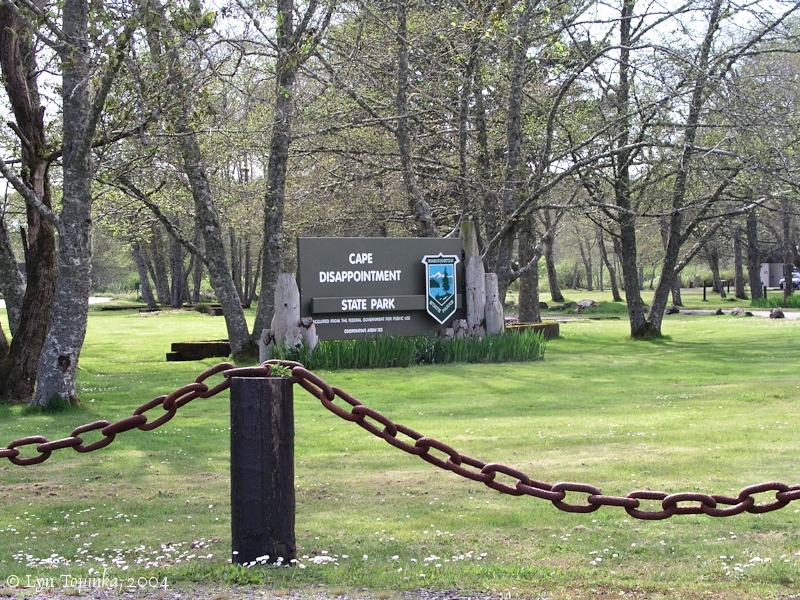 By the 1950s, the Fort Canby area reached a maximum size of 964 acres. 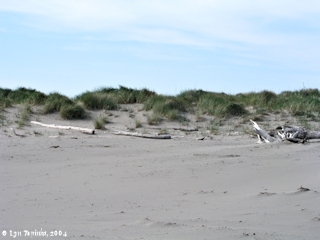 Since then, however the shorelines have eroded, By 1958, Peacock Spit had eroded, accelerating erosion on Fort Canby beach. "It took two years to prepare the north jetty surrounding for jetty-building, under the superintendence of G.T. McLean, junior engineer. Last Summer it was necessary to dredge Baker's Bay, north of Sand Island, so as to allow the large barges to come from Fisher's Quarry, back of Vancouver, over 100 miles away, and to land at Fort Canby, the rock necessary for building the jetty. An excellent quality of rock is being delivered by the Columbia Contract Company at $1.10 a ton, some of the single rocks weighing as high as 20 tons." Source: "Morning Oregonian", January 1, 1914. 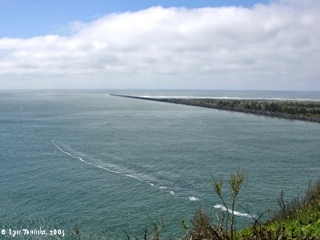 Click image to enlarge North Jetty, Cape Disappointment State Park. View from the Lewis and Clark Interpretive Center. Image taken April 19, 2005. 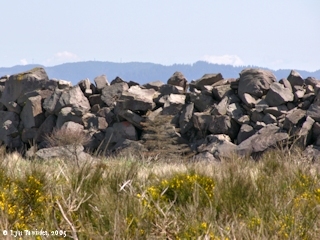 Click image to enlarge Rocks, North Jetty, Cape Disappointment State Park, Washington. View from the Lewis and Clark Interpretive Center. Image taken April 19, 2005. 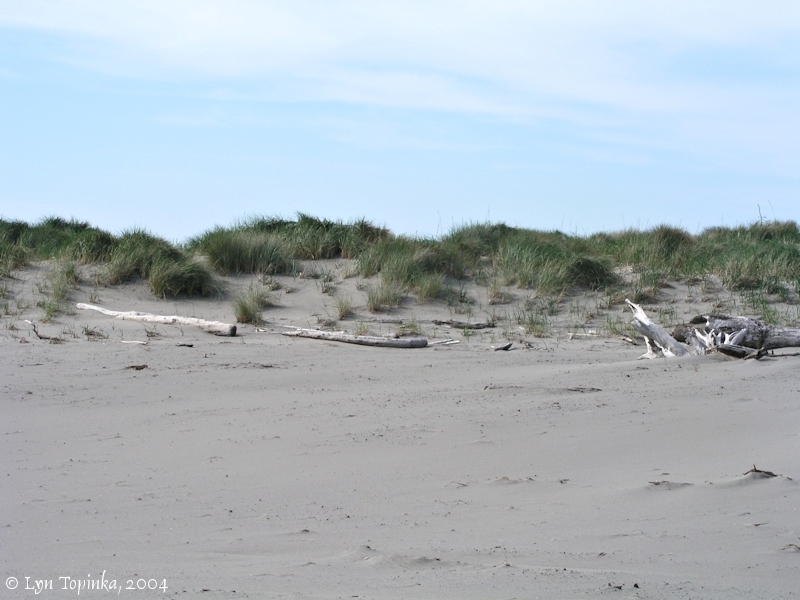 Click image to enlarge Sand dunes, North Jetty, Cape Disappointment State Park, Washington. Image taken April 9, 2004. 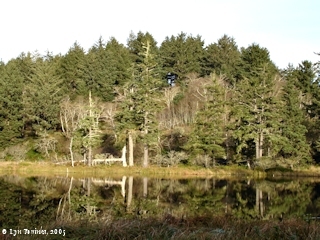 O'Neil Lake is located within Cape Disappointment State Park, between the park entrance and McKenzie Head. Quite possibly this could be Captain Clark's "pond" he wrote about on November 18, 1805. 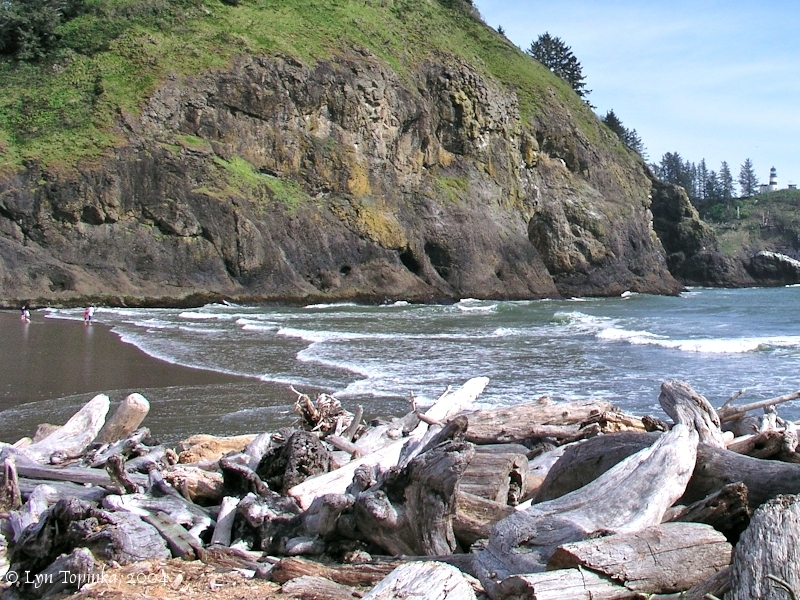 Today Cape Disappointment State Park campsites line the southern shore of O'Neil Lake. 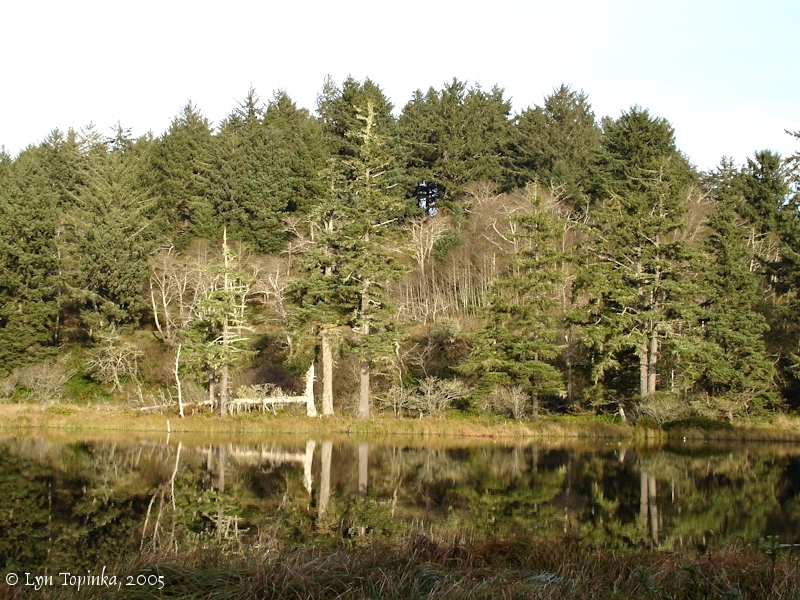 Click image to enlarge Lake O'Neil, Cape Disappointment State Park. Image taken November 9, 2005. 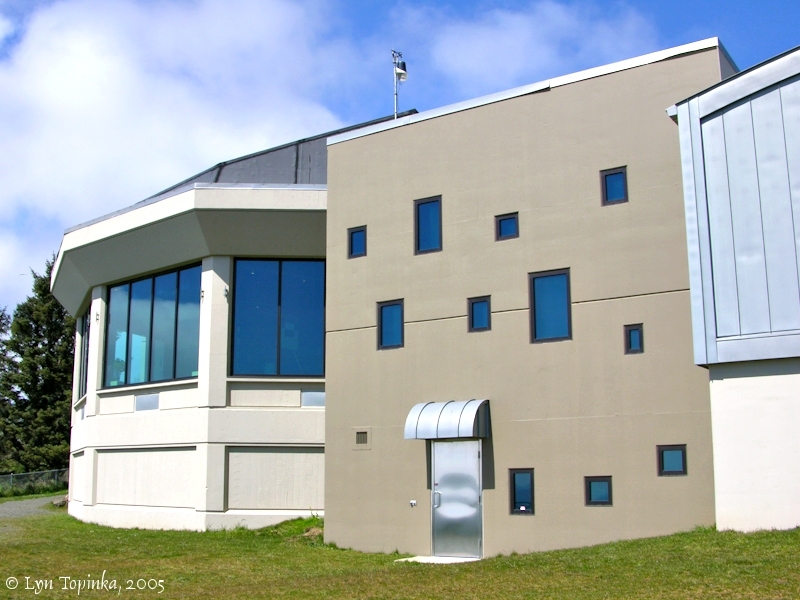 The U.S. Coast Guard Station Cape Disappointment is the largest Coast Guard search and rescue station along the Northwest Coast. It has (in 2006) 50 assigned crewmembers. Commonly known as Station Cape "D", the crew responds to 300 to 400 calls for assistance every year. The busiest time in between early June to mid-September when numerous recreational boaters cross the Columbia River entrance in search of salmon and other fish. The first "search and rescue" station built at Cape Disappointment was in 1877 on the site of Fort Canby, and was known as the "U.S. Life Saving Service Station". Volunteers manned the site until 1882, when the first full-time Life Saving Service crew was sworn in. In 1915 the Life Saving Service merged with the Revenue Marine Cutter Service to form the United States Coast Guard. The present site Cape Disappointment site was built in 1967 and is currently the site for Station Cape Disappointment and the National Motor Lifeboat School. On November 18, 1805, Captain Clark crossed a "low isthmus of land" in order to reach the Pacific Ocean. 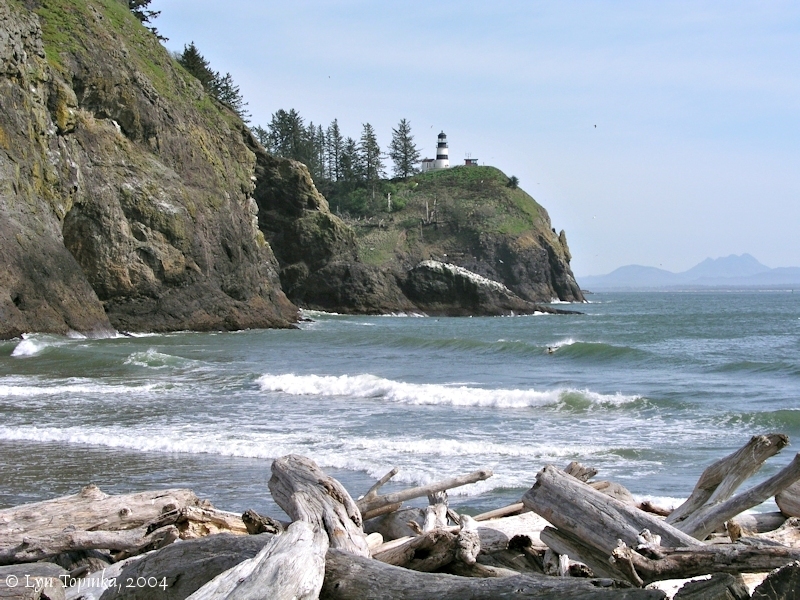 Today, the beach on this isthmus between Cape Disappointment Lighthouse and McKenzie Head is called "Waikiki Beach". Waikiki Beach received its name when a Hawaiian sailor's body washed on shore after his ship was wrecked in a failed attempt to cross the Columbia River bar in 1811. Click image to enlarge Waikiki Beach, Cape Disappointment. As seen from the North Jetty, Cape Disappointment State Park. Image taken April 9, 2004. Cloudy. Capt. Clark myself and 10 more of the party Set out [from their camp at Station Camp] in order to go down and see the passiffic ocean [Pacific Ocean]. we proceeded on round Hailys bay [Bakers Bay] crossed two Rivers [Chinook River and Wallacut River] in Sd. bay [Bakers Bay] . ... we proceeded on round high clifts of rocks where we had much trouble to pass.— towards evening we arived at the Cape disapointment [Cape Disappointment] on the Sea Shore. went over a bald hill [McKenzie Head] where we had a handsom view of the ocean. we went on a Short distance on the coast and Camped for the night.